Learn more about energy, energy systems and how it relates to greenhouse gases. Energy is power that can be used for many purposes. Its many usable forms include heat (thermal), electrical, nuclear, chemical and mechanical energy. There are two broad types of energy: non-renewable and renewable. Non-renewable energy comes from sources that are used up and cannot be replenished. Examples are fossil fuels such as coal, oil and natural gas. In Alberta, most of our energy comes from non-renewable sources. In Edmonton, approximately 95% of energy is from non-renewable sources. Renewable energy comes from sources that can be naturally replenished at a rate that is equal to or greater than their rate of use. An example is biomass energy, which commonly refers to plants such as corn, sugar cane and others that are grown for use as biofuel. Byproducts of the forest industry, including wood chips, sawdust and bark, are also used as biomass. Biomass is material derived from living organisms, both plants and animals. Biofuel is an energy resource made from biomass, or in Edmonton’s Waste-to-Biofuels facility, from municipal waste that cannot be recycled or composted. Renewable energy also comes from continuing natural energy flows, such as solar radiation, wind, flowing water and geothermal sources. Geothermal energy is accessible heat energy stored in the Earth’s interior, and is used to generate electricity or to supply heat. There is some debate about how to define the term “alternative energy,” but usually it refers to an energy source other than fossil fuels, such as the renewable energy sources listed above. How is energy related to greenhouse gases? Producing energy by burning fossil fuels such as coal and natural gas creates greenhouse gases (GHGs) by releasing stored carbon back into the atmosphere as carbon dioxide (CO2). Different energy sources and energy production systems produce differing amounts of GHGs. Generating renewable energy, such as from solar, wind and geothermal sources, produces few, if any, GHGs. Co-generation is also called “combined heat and power” (CHP). When electricity is generated, particularly through the burning of fossil fuels, heat is also produced. 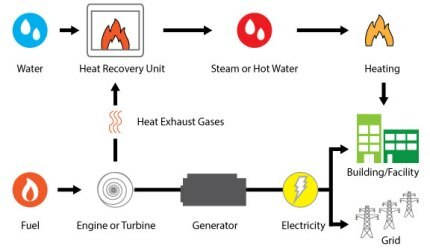 Rather than dispersing the heat energy through cooling towers or other means (and thereby wasting it), co-generation captures and uses it for heating water or for space heating. The captured heat can be used on-site or transmitted elsewhere. In a centralized energy supply system, electricity is usually produced far from where the electricity is used. Centralized systems can use a variety of inputs, including coal, natural gas and even hydro (water). Hydro generation occurs in many Canadian provinces, including British Columbia, Manitoba and Quebec, but is not common in Alberta. Typically, electricity in a centralized system is produced on a large scale and is transmitted over a large geographic area to supply the needs of many. The coal-fired plants west of Edmonton are an example of centralized energy, producing electricity for many end-users in Edmonton and far beyond. 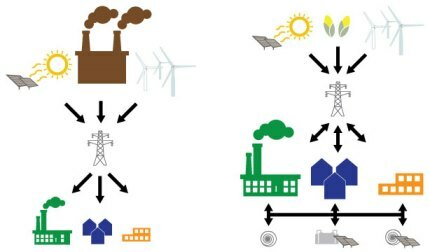 In a decentralized energy system, the energy is produced close to where it will be used. What is a district energy system? District energy usually refers to systems in which a single energy provider supplies several nearby end-users. For example, rather than every building on a block having its own furnace, one very large furnace or boiler would be installed and energy sent through a distribution system of pipes to nearby users. By sharing the costs for installation and maintenance of the heating and cooling system, everyone enjoys cost savings. Although not entirely interchangeable, sometimes people will use the term distributed energy when they really mean district energy. Co-generation is popular in district energy systems. The University of Alberta’s main campus is a great example of district energy system, one of the largest in North America. This term refers to small-scale generation of electricity (less than one megawatt, or 1,000 kilowatts) by a homeowner, small business or a community. Rooftop solar panels are an example of micro-generation. The energy might be stored on-site or, as is often the case in an urban setting, be fed into an existing electrical grid. Energy mapping is done to identify energy used within a specific geographic area. It helps identify energy requirements and opportunities for improving energy efficiency in the mapped area (e.g., a neighbourhood). This is the practice of creating structures and using processes that are environmentally responsible and use resources efficiently throughout a building’s life cycle. When “building green,” these practices are applied to all stages of design, construction, operation, maintenance, renovation and demolition. What is the difference between energy efficiency and energy conservation? Energy efficiency means less energy is used to perform the same service. For example, compact fluorescent light (CFL) and light emitting diode (LED) bulbs use less energy than an incandescent bulb to provide the same amount of light, thus making them more efficient. Energy conservation means reducing energy consumption (e.g., turning off a light, turning down the furnace and wearing a sweater, or walking or cycling instead of driving). Both energy efficiency and energy conservation contribute to reducing GHG emissions. Energy ratings help consumers choose products that use energy most efficiently. 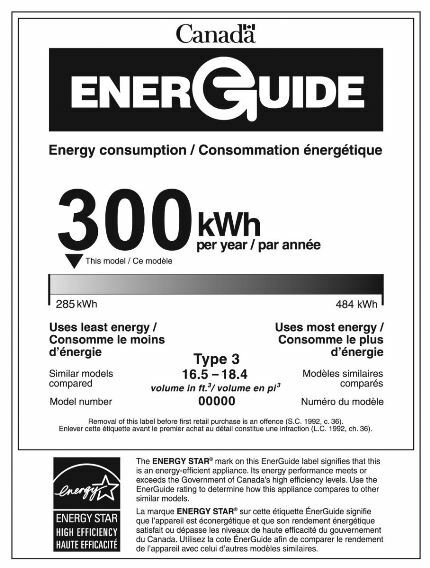 For example, Canada’s EnerGuide® labels appear on appliances, heating and cooling equipment, houses and vehicles. This label allows consumers to compare energy use of similar products when making a purchase. ENERGY STAR® is the international symbol of premium energy efficiency. Products that display the Energy Star symbol have been tested according to prescribed procedures and have been found to meet or exceed higher energy efficiency levels without compromising performance. How is energy use measured? Your household electricity use is measured in kilowatt hours (kWh). As electricity is used, the meter measures the amount in kWh. The natural gas used to heat our homes is measured in gigajoules (gJ) by a different meter. Visit EPCOR for information on how electricity meters work and how to read yours. Visit ATCO Gas for information on how natural gas meters work and how to read yours.